The agar plug method was first introduced as a taxonomic tool for Penicillium in 1983 (Frisvad and Filtenborg 1983). 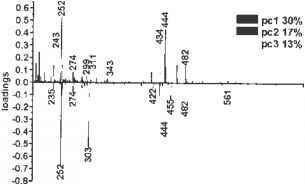 Figure 11 ESI+ mass spectra from injection of crude extracts of three Penicillium isolates. 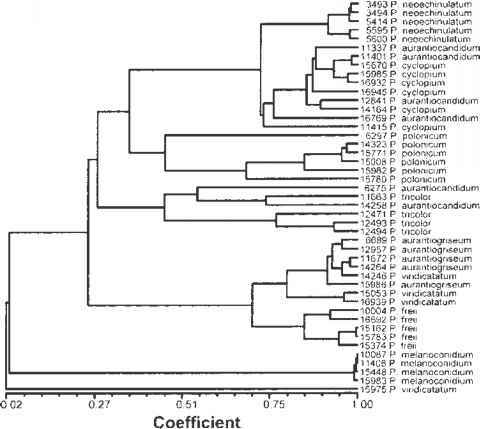 Figure 12 Cluster analysis of 45 mass spectra from direct infusion ESI + MS of crude culture extracts of Pénicillium species. Calculated using correlation coefficient and UPGMA linkage. 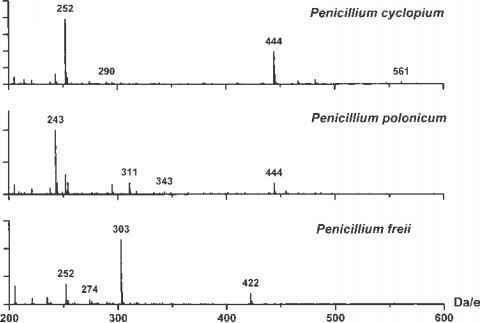 Figure 13 Loadings from the first three principal components from PCA analysis of direct infusion mass spectra collected from 45 isolates of Penicllium species from the Viridicata series. plate by gently pressing the wetted side down on the plate. The advantage of the method is that it is simple, cheap equipment is required, sample throughput is high, and with many groups of fungi can be identified as illustrated on Penicillium series Viridicata (the P. aurantiogriseum complex) later. In the general Penicillium procedure plugs from CYA media are examined for intracellular metabolites, whereas the plugs from YES are examined for extra-cellular metabolites. A normal 20 by 20 cm plate accommodate 21 lanes from each side, and so 10 isolates can be analyzed (Figure 14). The TLC plates are eluted in saturated chambers, dried and examined in daylight and under UV light (366 nm and 254 nm) and spots appearing are noted (color, shape, etc.). The spots are marked gently with a pencil (or the plate is photographed). This procedure is repeated after: the whole plate is sprayed with AlCl3 and heated at 130°C for 8 minutes; the CAP side is sprayed with Ce(SO4)2; the TEF side is sprayed with ANIS and heated at 130 °C for 8 minutes. On our web site http://www.biocentrum.dtu.dk/mycology/ analysis/tlc/ houses a collection of pictures of TLC plates from 18 of the cost common Penicillium species. Figure 14 The TLC-agar plug method. A 3 mm plug is cut from a colony and is placed directly on the TLC plate with the agar side down for the extra cellular metabolites or a drop of solvent is added to the mycelium side and the plug is placed with the wetted side down. The plate is eluted in two systems and the dried plate is examined under UV light before and after spraying. Cereals represent a habitat with a limited associated funga, and it is relatively easy to determine Penicillium species when kernels are placed on DG18 (Dichloran 18% Glycerol agar), DRYES (Dichloran Rose Bengal Yeast Extract agar) or DYSG (Dichloran Yeast Extract 18% Glycerol agar). When the Penicillium species are isolated and inoculated in 3-points on the identification media CYA, MEA (Malt extract agar), YES, and CREA (Creatine Sucrose agar) (Samson et al. 2000) it is relatively easy to observe that on MEA, most isolates have two stage branched rough stipes (terverticillate) and smooth conidia (excluding P. hordei), and that growth is inhibited on CREA. 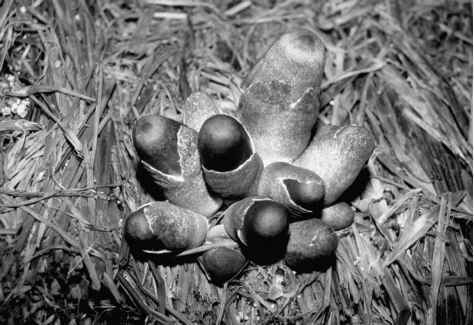 At this stage it is not possible to make a definite identification as these criteria fit with the following nine Penicillium species found on cereals: P. aurantiogriseum, P. freii, P. tricolor, P. polonicum, P. aurantiocandidum, P. viridicatum, P. cyclopium, P. melanoconidium (Penicillium series Viridicata), and P. verrucosum (Penicillium series Verrucosa). Agar plugs from twenty isolates on CYA and YES can be applied on a TLC plate (20 X 20 cm) within 30 min, and the plate developed in TEF (Figure 14). vianamideA,viridamine,ochratoxinA, and citrinin are visible as colored spots under UV light (365 nm), usually in highest quantities on CYA. Aurantiamine and viridamine are both seen as blue spots, however viridamine is more light blue and has a lower Rf than aurantiamine. Viridamine will identify the fungus as P. viridicatum, and can be confirmed by the presence of brevianamide A as a yellow spot. 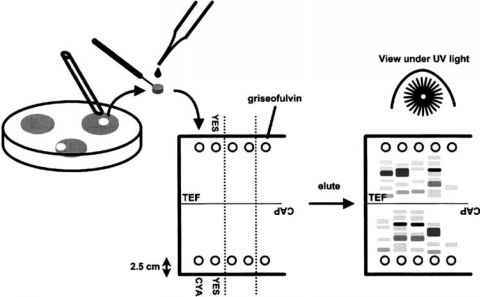 Aurantiamine can be produced by two species, but simultaneously detection of 3-methoxyviridicatin as a blue spot under 255 nm light, and xanthomegnin and viomellein identifies P. freii. P. verrucosum is identified by a tailing yellow spot of citrinin and a blue green spot of ochratoxin A. The TLC plate should then be sprayed with AlCl3 and then heated at 130°C for 8 minutes. Penitrem A is the visible as a bluish black spot in daylight and oxaline as a yellow brown spot very close to the application point. If both metabolites are present on CYA the fungus is P. melanoconidium. The TLC plate should then be spayed with ANIS and heated to 130°C for 8 minutes. In cultures from YES yellow tailing spots in daylight identify terrestric acid that in combination with aurantiamine definitely identify the isolate as P. aurantiogriseum. A yellow brown spot under UV light on CYA detects verrucosidin, which in combination with 3-methoxyviridicatin identifies P. polonicum. P. tricolor is identified as producer of terrestric acid, xanthomegnin and viomellein. Except P. tricolor and P. verrucosum all these species produce penicillic acid seen as a bluish red spot under UV light after ANIS spray. In summary eight of nine species can be identified solely based on TLC results however the species, P. aurantiocandidum cannot be identified using TLC results alone, and must be combined with the poor sporulation on CYA.